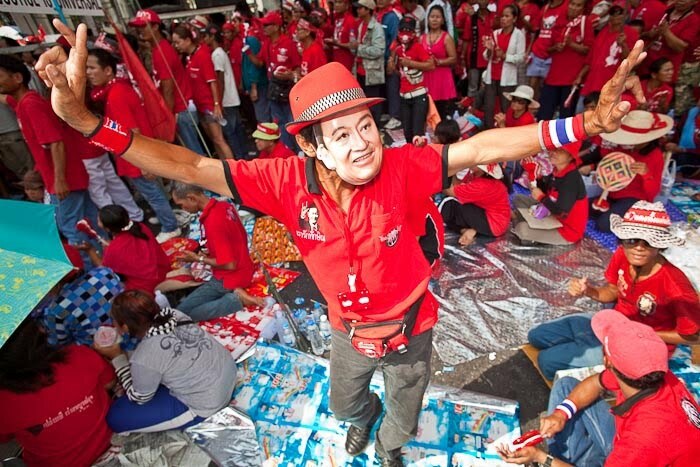 A Red Shirt with a Thaksin Shinawatra mask dances in front of Ratchaprasong intersection in Bangkok Sunday morning. You go out of town for one day and you miss all sorts of fun. I thought about going down to the protests last night, but it was after dark when I got back from my day trip and the government was threatening to unleash the hounds of hell on the protestors so I sat it out while I edited my stuff from yesterday and redid hotel and plane reservations for another up country trip (long story). But like all the previous government announcements that this is the Reds’ absolute last chance, this one was hollow. Nothing happened and the night passed peacefully. I got up early this morning and wandered down to the protest area. I hopped in a cab and he drove me through the roadblocks directly to the protest site. All the roads were reopened and most of the protestors were gone. At 7AM this morning 50 Boy Scouts and a water cannon could have cleared the protestors. I thought it was over. I made some photos of the protestors who were still there, tired but quite happy (Thai Sanuk) and thought this thing was over. About 8:15AM the protestors who left last night came back. And the Thai Police let them come back. The crowd kept growing. Motorcades from other parts of the city and some up country provinces arrived with much fanfare and the police let them drive in. By 11, the area was completely gridlocked again. A situation that could have been easily resolved at 7 was now, again, a crisis. I don’t completely understand what’s happening here. I’m not sure if the police are sympathetic to the protestors (I’ve seen some of them giving water to protestors, waving at them and posing for photos with them) or if they are incapable of controlling them. But whatever it is, the government seems to be unable to control this situation and everyday these protests continue like this the chances of a peaceful outcome become more remote. There are more photos from today’s protest in my PhotoShelter archive and available from ZUMA Press.